What to look for in a wheelchair ramp for home? What are the different types of wheelchair ramps for homes? 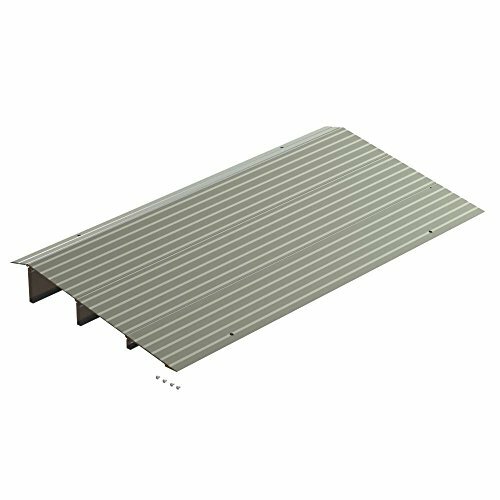 Which aluminum wheelchair ramp for home is best? Which foldable home wheelchair ramp is best? Wheelchair ramps for home are improving the lives of people everywhere. Individuals in wheelchairs face unique mobility challenges, even in their own homes. Fortunately, tools like home wheelchair ramps exist to make getting around easier. Whether you have a small set of stairs leading up to your front entryway or down into your backyard, a ramp can help eliminate these everyday obstacles. No matter how well someone can move in their wheelchair, it’s impossible to move up or down chairs with a ramp. Having a portable wheelchair ramp for your home gives wheelchair users greater independence. Travel in a van? Grab a wheelchair ramp suitable for van transport. So, you’ve made the decision of investing in a quality ramp for your home, but how do you know which one is right for you? We have compiled a list of the top 10 home wheelchair ramps for home as well as a helpful buyer’s guide to narrow down the shopping process for you. Let’s begin! First on our list is the Prairie View SFW330 wheelchair ramp. Users can expect several amazing features like the ability to carry up to 800 pounds, a wide range of sizes, and a sturdy handle for easy carrying. This ramp is durable, giving you the support and stability you need. Something that makes this model different from other ramps is that it’s welded rather than riveted. It has an anti-slip surface to avoid any mishaps from happening and it is great for wheelchairs and electric mobility scooters with different wheel configurations. + Holds up to 800 lbs. Why We Liked It – Although this wheelchair ramp is a bit heavier than most models, it’s among the stronger models on the market. We really like the anti-slip durable material it’s made from. Let’s move on to another popular option: the Titan Multi-fold ramp. This ramp comes with a number of helpful features from its extended length to its easy-to-secure lip. It is able to withstand up to 600 pounds, and its slip-resistant material provides a safe and efficient means of travel. Despite its heavier weight and longer length, this model’s nylon handle and folding ability make it easy to carry, while the aluminum frame provides more durability and security. Users will have a pleasant experience with the Titan Ramps Aluminum Multifold – it’s definitely one of the top models on the market. + Holds up to 600 lbs. Why We Liked It – This ramp’s heavier weight may scare some consumers, but its unique folding design and handle makes it surprisingly easy to carry. The aluminum material provides durability with no expense to safety with its non-slip surface. This next model is also a product of Titan Ramps. 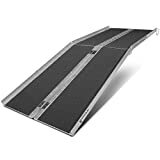 While this ramp has a shorter length and a lower weight capacity than the previous model, it provides the same benefits in its anti-slip surface, stable frame, and convenient handle. This model is wide enough to accommodate most scooters, wheelchairs, and walkers. The major distinguishing feature in this model is that is it much more portable. It is built to securely fit in the trunk of your car and is best for going up a single step of 4 inches. For users in search of a mobile and easy-to-use ramp, this model proves to be effective. + Holds up to 500 lbs. Why We Liked It – This Titan Ramps model contains everything users may need in a ramp: a non-skid surface, durable construction, and easy portability. We ask anyone who requires a safe, portable ramp to consider this product. Next up, the Clevr 3-foot ramp is another reliable portable ramp. The aluminum material, rough, weather-resistant surface, and safety pins maximize security and durability while this product is in use. In addition to these features, the Clevr ramp is able to fold and be carried by its attached handle for easy moving and storing. Probably the most incredible feature of this model is its ability to carry up to 600 pounds, despite weighing only 16 pounds. It is very lightweight and small, but its wide frame provides safe travel for wheelchairs and scooters. + Weighs only 16 lbs. Why We Liked It – We recommend the Clevr 3-foot wheelchair ramp because it meets every safety standard and still manages to be extremely lightweight and easy to move. Now let’s look at the Prairie View TH1032. This small wheelchair ramp is specifically built for passing through doorways and covers up to ¾ of an inch. It comes with holes in the corners and the necessary equipment for installation. This simple model allows users in wheelchairs or scooters to easily move around the house. Although this product only weighs about 4 pounds, it can withstand up to 600 pounds due to its strong aluminum construction. The surface is composed of non-slip, high traction material to ensure safe and smooth passage. Why We Liked It – This product is perfect for avoiding the constant hassle of going through doorways. We particularly enjoy its light but a strong frame that provides a stable base. 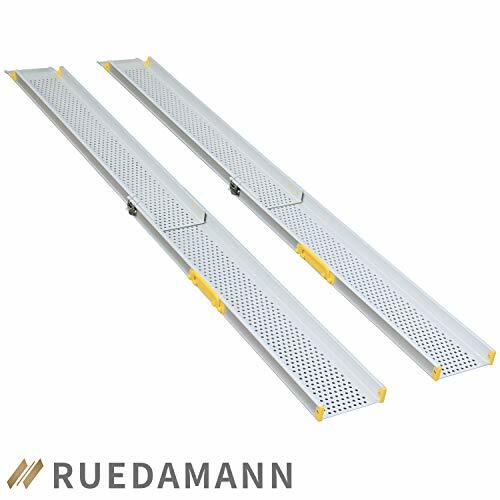 Next, we look at the Ruedamann model that uniquely comes as two separate ramps. These aluminum ramps can be adjusted from 4 to 7 feet using lock clips and can carry up to 600 pounds. They are slip-resistant, and small holes in the aluminum allow water to drain through. These home wheelchair ramps are very light, and they each have a small handle attached for easy transport. The ability to adjust in size also helps save space in storage. Users must keep in mind that these ramps are meant for wheelchairs where the front and back wheels are in one line. Why We Liked It – This unique pair of ramps for wheelchair access at home is easily portable because the space between them gets rid of some unnecessary weight. And despite the lightweight material they’re made from, they are still very durable. Another great wheelchair ramp is the EZ-ACCESS Threshold ramp, which includes interchangeable parts that allow it to be used for doorways or raised platforms up to 6 inches. It is a very light but sturdy ramp that can withstand up to 700 pounds. This lightweight, aluminum material and its free-standing feature make it very easy to pick up and move around. The EZ-ACCESS wheelchair ramp has a width of 34 inches that helps accommodate for a variety of wheelchair sizes, along with walker users. It also comes in different lengths and styles to satisfy a variety of needs. + Holds up to 700 lbs. 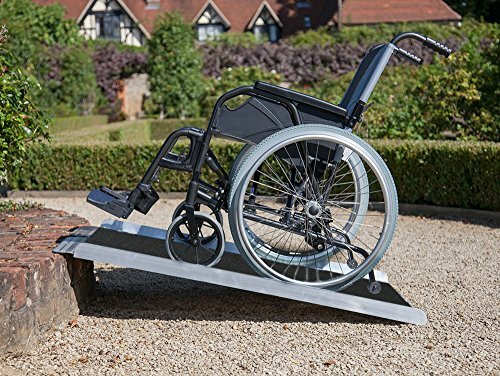 Why We Liked It – By being very light but strong, this ramp can be used throughout the house and in the car, and its interchangeable parts make it super easy to adjust to different heights. The Silver Spring Multi-Fold wheelchair ramp has several admirable features. The welded aluminum construction and slip-resistant surface make this model very durable and secure, but you don’t have to sacrifice portability because its folding capabilities and attached handle means it can also be easily transported from place to place. This product is available in several different lengths to allow passage over many different heights, and it is able to withstand up to 600 pounds to support many wheelchairs, scooters, and power-chairs. This ramp is exceptional for getting up steps, sidewalks, and other elevated surfaces. Why We Liked It – We really enjoy the functional features of this ramp. It has a handle for easy carrying, a non-slip surface, and made from quality, welded material. Everything you need, the Silver Spring Multi-Fold has! Another product of Prairie View Industries, this wheelchair ramp model is built for any doorway, whether it swings in or out. Users are able to adjust the height of the ramp to accommodate rises between 1 and 2 inches, and the necessary hardware to secure it in place is included. The Prairie View ATH1232 model is made of welded, non-slip aluminum that makes it durable enough to support up to 800 pounds, despite having a weight of only 6 pounds. It is 32 inches wide to allow most wheelchairs and scooters to travel through. + Weighs only 6 lbs. Why We Liked It – Much like the other Prairie View products, this ramp is extremely durable and safe. The neat feature of this model is its ability to accommodate any transitioning doorway. 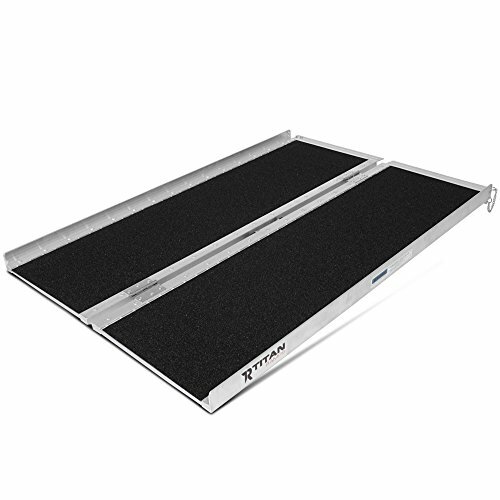 To wrap up our list, we take a look at another Titan Ramps product, specifically the Multifold home wheelchair ramp. 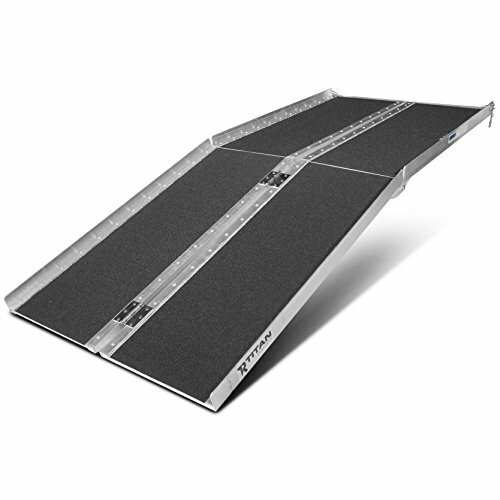 With its aluminum material and non-slip surface, this ramp maximizes safe and easy traveling. In addition to this, the 6-foot length permits passage to many elevated surfaces, including sidewalks, porches, vehicles, and more. This handicap ramp for the home can hold up to 600 pounds, and holes in the lip allow it to be secured in place. As its name implies, you can fold this ramp, and its handle allows you to carry it easily to store it away or move it to another location. Why We Liked It – This wheelchair ramp is long enough to accommodate multiple elevations, and its folding ability means users don’t need to struggle to carry it. Like always, we really like the safe, strong material Titan Ramps use. Shopping for portable wheelchair ramps for home entrance can be a time-consuming and tedious process when you don’t know what to look for – luckily, we do! In this buyers guide, we will teach you everything you need to know to come to an informed decision about the ramp best for you or your loved one. Let’s get started! Do you need an entry or suitcase ramp? Both types of ramps are great for home use and accommodate your living space in different ways. They both offer permanent solutions to getting up some stairs or over a door lip. If you need to move up 2-4 stairs, we suggest you go for a suitcase ramp. Anything lower, an entry one should do the trick. Entry ramps are great to eliminate safety hazards like door lips that you can’t step over. A good solution to this is a small compact entry ramp. You don’t always need long and large suitcase ramps. 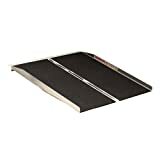 Moreover, these access ramps for the home are available in lengths up to 3 feet, while suitcase ramps accommodate anything higher than this (they can extend up to 10 feet). Do you need a permanent or portable ramp? The question you want to ask yourself here is if you plan on traveling with the ramp or need one permanently installed within your home by a contractor. If you need a temporary ramp that you can move from place to place go with a portable ramp. If all you need is one that helps you move around within your property a permanent ramp is a wise decision. 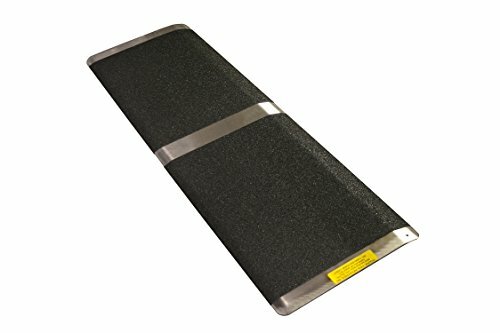 What size ramp am I looking for? This is where we suggest you pull out your tape measure and obtain accurate measurements for the ramp. Be sure to start of measuring the width of the threshold, landing, and step. Next, you need to measure the vertical rise (overall height measured from the ground up to where the ramp will rest). Additionally, consider the slope or incline of the wheelchair for your mobility aid. This information can be found in the owner’s manual of your wheelchair. Finally, you want to be sure you have enough room on your porch to accommodate the ramp’s length. You need a ramp that can support you, your caregiver, the wheelchair itself, and anything else you carry with you. Think about the maximum weight that the ramp will need to support and keep this capacity in mind when making your selection. There are a few things you need to consider when looking for a wheelchair ramp. Consider the features that you need it to have. What is the maximum weight it will need to carry? Do you need a portable ramp or permanent ramp? You also need to know what size ramp you need before you begin the shopping process. Keeping these things in mind will narrow down your search getting you one step closer with the wheelchair ramp best for your home. Wheelchair ramps for home entrance come in a wide variety of styles and sizes that offer different functions for your home. There are Lego-style threshold ramps, aluminum threshold ramps, rubber threshold ramp, portable suitcase ramp, pathway ramp, modular ramp, or custom-made ramp. 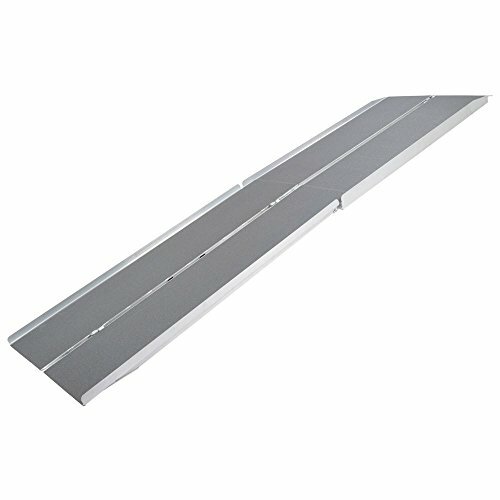 Aluminum threshold ramps are very lightweight and have a non-slip surface with 600 lb. weight capacity. We really enjoy the Titan Ramps 7’ ft aluminum multifold ramp. It is able to hold up to the 600 lb. weight capacity and is slip-resistant to ensure your safety. The Prairie View Industries SFW330 is proven to be extremely safe and offers a single fold feature that makes it very portable. It holds up to 800 lbs. and is available in several different sizes. The anti-slip surface makes it easy to navigate and helps to prevent accidents. If the home design is important to you, consider a wheelchair ramp that will blend in with your home décor. Especially if using it indoors, you can find quality options such as rubber threshold entry ramps that come in colors of black, brown, or gray to match the overall style of your home. Did You Know? In the United States alone, it’s estimated that more than 3.6 million people report using a wheelchair in some capacity, and an estimated 1.6 million of them are under the age of 65. The main function of a wheelchair ramp is to ensure the safety of the individual using the wheelchair as well as their caregiver. With the types, styles, and sizes currently on the market, shoppers will have no problem finding one that fits their budget, needs, and intended use. We hope this buyer’s guide and review has given you a better understanding of wheelchair ramps and the benefits they bring into the lives of those who utilize them. The list of top 10 ramps provided above really exceeded our expectations when it comes to a quality selection. We’re sure you’ll be happy with any of our reviewed models. We wish you the best of luck in your selection and happy shopping! Length 2',Width 30",Folded Size 24" x 16" x 4 7/8"